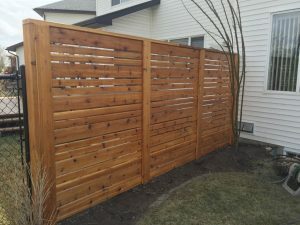 Chinook landscaping and design installs high quality fences and decks. You can choose from many difference materials for your fence or deck including cedar, pressure treated, meranti hardwood, composite or vinyl. Choosing your fence or deck material. If you are choosing your fence and deck material based on budget then your first choice will likely be pressure treated wood. Pressure treated wood is the least expensive material when it comes to building a fence or deck. Pressure treated wood stands up well in Calgary’s climate and it can be painted or stained. If you don’t mind the maintenance that goes with pressure treated wood then it may be a good option for your landscaping project. When it comes to fences, 4×6 pressure treated posts should always be used. Avoid using 4×4 posts as the can tend to warm or bend and they don’t handle the weight of your fence as well as 4×6 posts. A screwed fence or deck will always last longer than a nailed one so make sure to screw your fence and deck boards in order to give your deck or fence a longer life. Cedar fences and decks are not much more expensive than pressure treated and add a beautiful look to your front or back yard landscaping. Cedar can be painted or stained. IF you paint your cedar fence or deck it will require the same repainting as pressure treated. About once very 5 years. If you choose to stain your cedar deck or fence you will need to stain it once every two years at a minimum and preferably once a year. Meranti hardwood fences are the most expensive wodod material but the fact the wood is a hardwood as opposed to a soft wood like cedar means your fence or deck will last longer. The look of Meranti hardwood is rich and classy and is hard to beat. Composite decks are fast becoming a popular choice for our landscaping clients. Older composite decks tended to warp and discolor but the new materials seem to be much better and do not have these defects. Composite deck material is costly, more than cedar and about the same as Meranti but they do not require any painting or maintenance. Vinyl fences are a great choice if you are looking for a zero maintenance option. The cost for a vinyl fence is more than cedar or pressure treated but zero maintenance means you will save on paint and stain over the years. Chinook landscaping and design offers all of these fence and deck options. Call us today to discover what option is best for your property.